As global trade increased in the seventeenth and eighteenth centuries, Europeans became enthralled with visions of Cathay, as China was popularly known. Chinoiserie, the ornamentation featured on this tapestry, is an enchanting decorative motif depicting imaginary and whimsical interpretations of life in Asia. 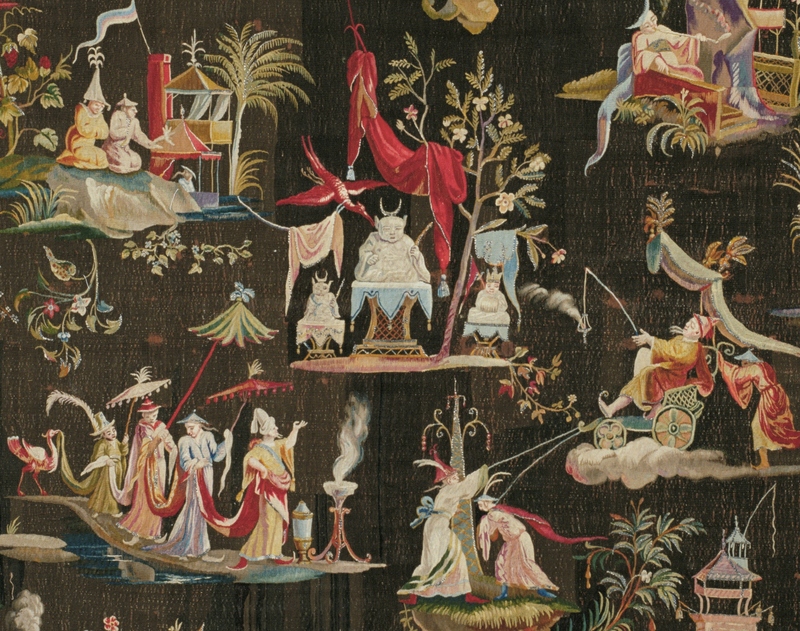 An eighteenth-century European concept, chinoiseries typically present exotic figures clothed in flowing robes and elaborate headdresses, and situated in fantastical landscape settings. Whether these figures represent people of China, India, the Middle East, or Japan is often difficult to determine; they are a mélange of peoples referring not to geographical and cultural boundaries so much as to a general concept of Asia. Altar of the Three Buddhas (detail), commissioned in 1717, Judocus de Vos (Flemish, Brussels, 1661-1734), wool, silk, metallic threads, 105 1/2 x 85 1/16 in., Gift of Guendolen Carkeek Plestcheeff Endowment for the Decorative Arts, Anonymous, General Acquisition Fund, Mildred King Dunn, Richard and Betty Hedreen, Decorative Arts Acquisition Fund, Margaret Perthou-Taylor, Bill and Melinda Gates Foundation Art Acquisition Endowment Fund, Ann Bergman and Michael Rorick, Mr. and Mrs. David E. Maryatt, 2002.38.1. Now on view in the European art galleries, fourth floor, Seattle Art Museum.